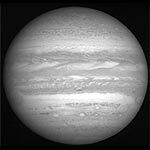 Hot on the heels of the Rosetta Flyby, NASA/JHUAPL’s New Horizons spacecraft flew by Jupiter last week, en route to the icy Kuiper Belt Object Pluto, and returned some lovely photos of the gas giant and its moons. 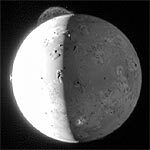 Most of the public buzz surrounds this photo of Io, which shows at least three huge volcanic plumes, most notably that of Tvashtar near the moon’s north pole. 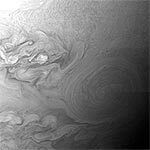 The New Horizons team also put together this animated global map of Jupiter showing the movement of its storms over a full 10 hour rotation. Lovely stuff, and I eagerly look forward to the Pluto-Charon encounter in 2015. Just eight and half more years!